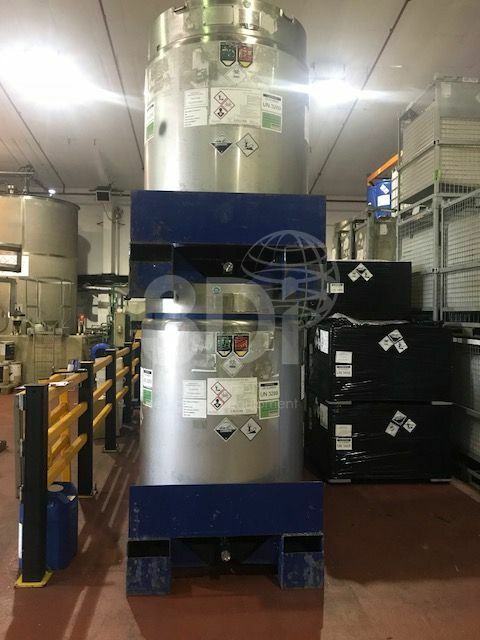 Used 1,000 Litre Pressure Discharge Intermediate Bulk Container (IBC), manufactured by Bison IBC. Material of construction: 316 stainless steel IBC, mild steel framework. Orientation: vertical, cylindrical, dished top and bottom. Supported mild steel base with 2 way pallet and 4 way forklift truck entry. Dimensions: 1200mm width, 1200mm depth, 1810mm height. Connections: (1) 460mm top inlet, (1) 50mm bottom outlet. Working pressure 1.36 bar. UN Group 11 approved. Stackable.